If you’ve seen Erwan Heussaff’s video of his recent trip to Korea with Anne Curtis, then you’d know that it was mostly of Anne fangirling over the country where her favorite K-dramas and oppas are from. That’s not the only proof—check out her Instagram and you’ll see that she has been Korean-ized from head to toe. Take a look at some of her #ANNEyeonghaseyo OOTDs below. She started back in May with subtle hints like wearing a ribbon on her ponytail. That evolved into pink bows in true K-drama style. Then moved on to all-out cutesy ensembles. Including that time she paired her white Acne Studios Adriana sneakers with cute cat stockings. Sometimes she lets her white tee do the talking. Other times you’ll find her wearing the same Acne Studios sweater Gong Yoo was caught wearing. She also started pairing scalloped Peter Pan collared shirts with sweaters (Gong Yoo was also spotted wearing this Acne Studios pullover). This isn’t just any pink hoodie. This look was inspired by the drama Strong Woman Do Bong-soon. To say she’s a fan of Weightlifting Fairy Kim Bok Joo is an understatement because she even bought the exact same Stereo Vinyls pullover Lee Sung Kyung wore in one of the episodes. She rocked the look to the fan meet of none other than Nam Joo Hyuk (where else?!) in Manila. Does the hoodie look familiar? It’s also the same Nohant hoodie both Lee Sung Kyung and Nam Joo Hyuk wore in and out of the show (just in a different color). 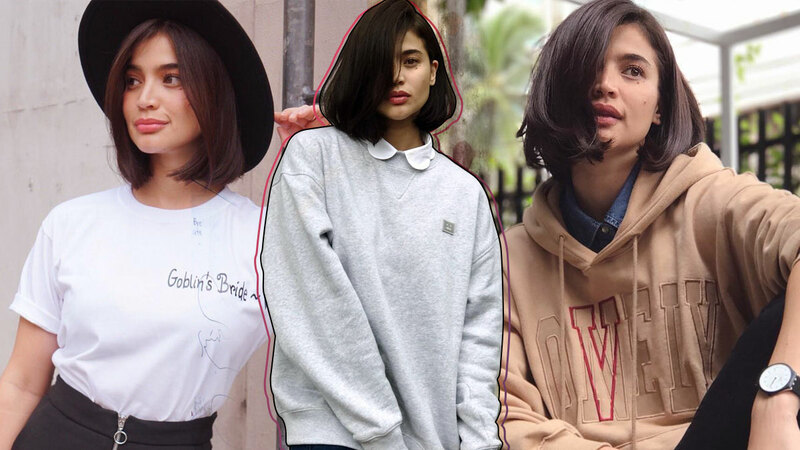 In just a few months, Anne Curtis went from simply copping her favorite K-drama’s looks to fully embodying Korean street style. She’s even been shopping from Korean brands like Romantic Crown, as shown in a couple of OOTDs (including the one below). And yes, even Erwan can't do anything about it. Too cute!